Learn about Bardstown, Kentucky by reading Bardstown —My Old Kentucky Home—Real Southern Welcome by Charlie Spence, Travel Writer. It features a mini, but thorough tour of the destination, plus all you'll need to know to plan your trip including getting there, objective information on places to stay and eat, and things to do. At the end of the article, we've provided a summary of the contact information for your easy reference. Enjoy! When you think of Kentucky, most often the first thing to come to mind is the exciting Kentucky Derby at Louisville’s Churchill Downs, but just a few miles from there is a place steeped in tradition, history, and plenty of attractions to make your visit one to remember. It is Bardstown, only 40 miles south of Louisville. Bardstown in where you will visit My Old Kentucky Home, the dwelling place Stephen Foster wrote about so lovingly. He wrote not only the song of that name but more than 200 others including the traditional Oh Susanna, De Camptown Races, Beautiful Dreamer, Jeannie With the Light Brown Hair, and others, as well as minstrel shows. As America’s first song writer he penned many, although song writing was not looked upon as a proper occupation in those early days. Foster wrote My Old Kentucky Home after moving back to Pittsburgh. As a lover of the South, his songs carried lore and love about the land. He is the only song writer to have two of his works chosen as state songs. In addition to Old Kentucky Home, state song of Kentucky, his song Old Folks at Home is the state song of Florida. Perhaps his birthday of July 4, 1886 helped push him to write lovingly about his land. At the Old Kentucky Home State Park, Foster’s music fills the air and adds to your enjoyment of this nostalgia. You will find an exceptionally lively fireworks display, games and a show in the amphitheater on July 4 to celebrate the birthday of America’s first songwriter. On Springfield Road, Route 150 just outside the city, visit the plantation known as My Old Kentucky Home. In the late 1700s this place was built by a prominent judge and lawyer. Since it was opened to the public in 1923, thousands of visitors have toured where the judge and his wife entertained such visitors as Henry Clay, the Marquis de Lafayette and many others. Nostalgia with the song maker is but a part of the attraction of Bardstown. Whether you are a teetotaler or one who enjoys a nip now and then, a visit to the distilleries is interesting. Bardstown is the Bourbon Capital of the World®. Take tours of one or more of the bourbon distilleries. Here you can explore the birth of bourbon, create a personalized souvenir bottle, or view an authentic moonshine still, which is believed to be the oldest in the world. At the Museum of Whiskey History you will find whiskey artifacts going back as far as pre-colonial times carrying up to beyond post-prohibition days. Here are antique bottles, advertising art, and novelty containers. Civil War buffs will find the Bardstown area particularly attractive. The battle of Bardstown was fought on October 4, 1862. It was the turning point in the war for the Eighth Texas Cavalry. At the Civil War Museum, which is at Old Bardstown Village, you will see more about this battle and other pages in Kentucky’s role in the Civil War. Important as it was, the battle of Bardstown was overshadowed four days later by the Battle of Perryville. Bardstown remembers women in the Civil War as well, and is an opportunity to get a glimpse of how women participated in fighting the war. Administered by the Civil War Museum, this building recognizes the role of women in the war through nursing, spying, and often masquerading as soldiers. This is believed to be the first of its kind paying tribute to women of the war. Another attraction you will want to visit is the Kentucky Railway Museum. This building is the re-creation of the original Louisville and Nashville Railroad depot. The attraction is in New Haven, just twelve miles south of Bardstown. (Closed January through March.) After seeing the railroad artifacts and the display of model trains, take a 22-mile scenic ride behind a steam locomotive through the rolling Fork River Valley. And for a reflective evening, arrive at this pre-Civil War depot for a small libation before boarding 1940 vintage dining cars, which have been beautifully restored, for an elegant meal as you ride and dine in the slower pace of steam railroad travel. Along Museum Row you will want to visit Old Bardstown Village. 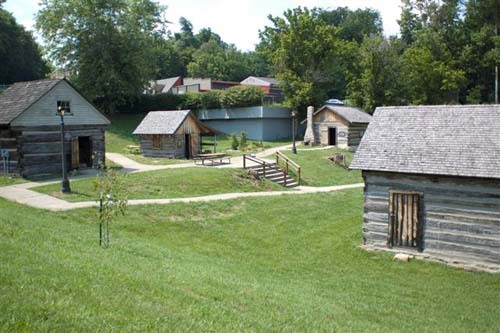 This is a re-creation of a 1790s frontier village. It represents the beginning of the movement westward in the then new colonies. Cabins are 150 to 200 years old. Come back to modern times with hiking, canoeing, kayaking and family fun. At the Bardstown/Nelson County Airport you will find Horizon Hoppers Adventure Services that specializes in family fun. Canoe and kayak trips are available to let you take the kind of water journey you like from smooth floating on the quiet waters of a river or lake to running the rough current of another section of river. Trips are available on five different rivers and lakes in the area. Plan your fun from half-a-day to three days with camping out. If you are a tenderfoot at roughing it, outdoor education classes are available where you can learn the basic principles of backpacking. Reservations are required. Contact at 502-507-9364. The Bardstown Opry features a show every Friday evening with some of country music’s best entertainers as special guests. When this is written, admission for an excellent show is only $10 with children 6-12 years of age $6. You will find this at the Bluegrass Entertainment and Exposition Complex. Dating back to 1780, Bardstown is the second oldest city in Kentucky and by many considered to be one of America’s most interesting small towns. More than 30 annual events draw visitors from around the globe. It’s known for its historic surroundings. Nearby is where Daniel Boone explored in 1769-70 and carved his name on the trees, where Jim Bowie used that Bowie Knife before losing his life at the Alamo. Bardstown brags that “it has the spirit”—a Southern spirit for hospitality, a religious spirit that is home of the first diocese of the west, and home of a little spirit called bourbon. As they say in the South—y’all come. Bardstown is approximately 35 minutes from the Louisville, Kentucky International Airport. Rental cars are available. Take I-65 south approximately 35 miles to exit 112. Off the exit ramp take a left turn on Highway 245 and follow it 15 miles to Bardstown. There is no train service to the city. For a real touch of Southern hospitality, check in at one of the many bed and breakfasts, some of which date back to when they were stagecoach stops, but have been beautifully restored. Various levels of accommodations are available at a selection of hotels and inns. Make your choice of reservations through WTA’s Online Travel Booking Service to get the best deal to suit your travel needs. Bardstown has several fine old restaurants in addition to the usual quick cafes and fast food chains. The Old Talbott Tavern on Court Square is considered the oldest western stagecoach stop in America as the colonists expanded west, bringing explorers from the east. 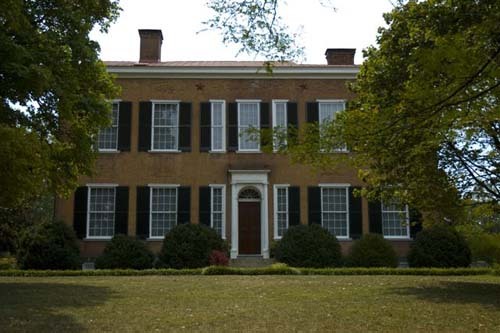 Chapese House, built in 1787, is a mansion and one of the historic places for bourbon tasting in the state. Kresos restaurant is formed from two theaters side by side. Although the buildings are old, conversion to a restaurant is new, being opened in 2004. Rosemark Haven is a dining room of one of the town’s excellent bed and breakfasts. Its menu blends classic Italian with dishes having a Kentucky influence. Notice: This information is current as of September 2010. It is recommended that you contact the numbers, and/or visit the websites above to determine any changes to the information.